After the lighter fare of my last post it’s time to get back into some car projects. Let’s tear down a Heinkel Kabine front suspension! The front end of a Heinkel is the hardest part of the car to rebuild. Why? Because the front end on a Heinkel can be extremely difficult to disassemble. 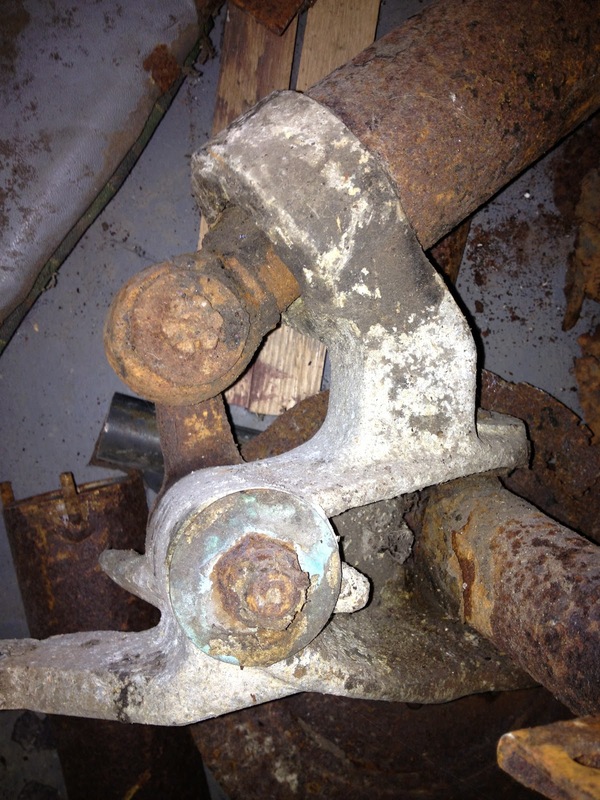 Any car that has sat outside and/or unused for long periods of time is going to have rust. The suspension is close to the ground and is a magnet for moisture, dirt and mud. Caked on grime traps in the moisture, and then the rust and oxidation continue unchecked. The moving parts with close tolerances seize up, nuts rust away to little stubs, and then you’ve got quite a disassembly job on your hands. The Workshop Manual covers some assembly and disassembly steps; I’ll cover what to do on the other parts, and what to do when some of the Workshop techniques fail. The front end is a combination of three separate systems; steering, brakes, and a dampening system. This combination is far more complicated than the front end of a Heinkel scooter. Hammer, Heat, Oil, Repeat: My first approach involved traditional removal techniques. The suspension is held onto the car body with eight 8mm bolts. You may need to cut these off of the car, depending on the level of corrosion. Or, they may come off easily, bringing a section of the floor with them! Have Some Floor with that Axle removal! Hubs: These are held on to a stub axle with a nut and cotter pin. Because they were usually overly greased, you can get the nut off without much trouble. The hub itself is another story. On my hubs the brake pistons had overextended and locked the brake shoes against the hubs. I had to use a large puller to remove the hubs, unfortunately bending and destroying the brake shoes in the process. Once you remove the hubs you’ll get to see the full extent of your disassembly job. Brake Components: Each wheel has a slave cylinder to activate the drum shoes. These are attached to the backing/dust plate with two screws, and also have a bleed as well as a banjo connector that attaches to a brake line. The easiest disassembly technique here would be to grind all of these off. Don’t do it! Many of these parts are no longer available, so you need to be extremely careful. Everything on my suspension was hopelessly rusted together. I had to use a few different strategies to remove the parts. Brake Cylinder Removal: For removing the slave cylinders I use a lot of heat and penetrating oil. Because the retaining screws are straight screws and heavily rusted, I used a Dremel to grind new slots into the screw heads, which I then carefully removed. It helps here to have the right screwdrivers. You want a blade thickness exactly matched the slot, and the shaft and /or grip of the screwdriver to be either hexagonal or have parallel flat surfaces you can use to grip the screwdriver with a wrench. Assuming you have the right equipment as described, put the screwdriver in the slot, hammer it a few times in an attempt to loosen any corrosion, press on the screwdriver with one hand, and turn the wrench attached to the screwdriver with the other. This technique gives you a lot more control and minimizes tear out of the screw slot. This will work just about every time. 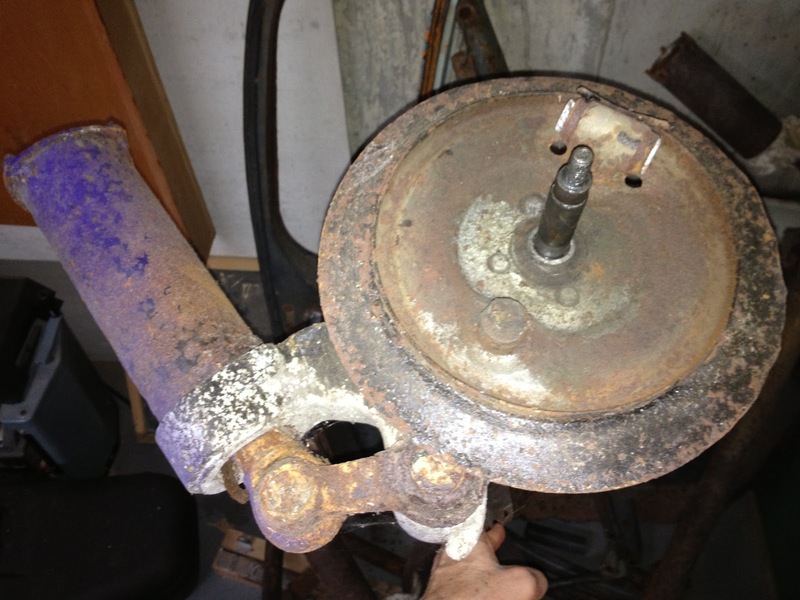 Once you remove the brake cylinders you’ll need to restore them, but that’s another topic. Axle Crank: After you strip off the brake components, you can work on removing the axle crank from the rest of the suspension. 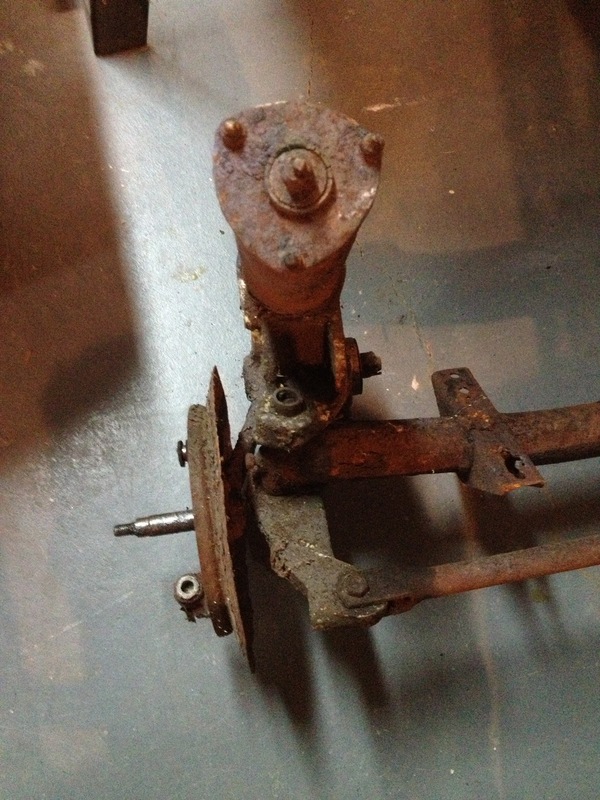 This involves removing two large castle nuts and cotter pins that are probably very rusty. On my car and the three sets of suspensions I have, they were hopelessly rusted up, in some cases to the point where there wasn’t even a set of flat sides to grip with a wrench. In a case like this I suggest using a nutcracker. Clean up the area as best you can, remove the cotter pin if possible, and then crack the nut. If you’ve never used a nutcracker, they’re quite handy. They consist of a hardened metal wedge that you tighten against the nut until it cracks. You’ll probably have to do two sides of the nut to really break it. 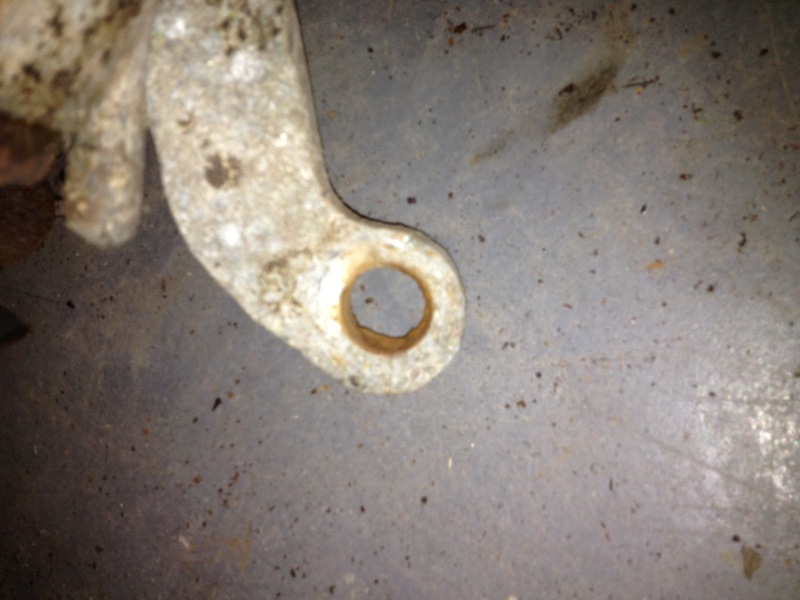 Remove the nuts and then hammer out the stub axle. When hammering out the stub axle from the shock absorber, you might find that the inner metal bush of the shock absorber is stuck onto the axle crank. In this case you’ll have to carefully grind off the metal sleeve without nicking the underlying shaft. Tie Rods and Drag Links: The next task is removing the steering components. The steering tie rods are held to the knuckles with pins.You’ll have to deal with four pins; two for the steering tie rod and two for the rod that keeps the wheels aligned. The pins run through bushes (which will you have remove as well) and are attached with a castle nut and cotter pin. On my cars, no amount of hammering was going to remove them. My solution was to saw off the nut completely and expose the shaft where the pin went through the bush. Then I took the assembly outside and burned out the bush (it’s made of rubber) with a torch. I was then left with a metal race, which I removed with a hack saw. The whole thing was a time consuming and ugly process! Disassembling the rest of the shock assembly involves removing the top of the shock absorber from the tube it’s in, and removing the spring. The top of the shock extends a plate retained by three 10mm nuts. All of these items suffer from exposure to the elements, and because replacement shocks are not available, you need to be careful removing the nuts. This is another place to use a nutcracker. You might be tempted to spin the nuts off with an impact wrench, but I broke one of the posts and had to re-weld another piece on. Kingpins: We’re saving the best for last- removal of the kingpins. 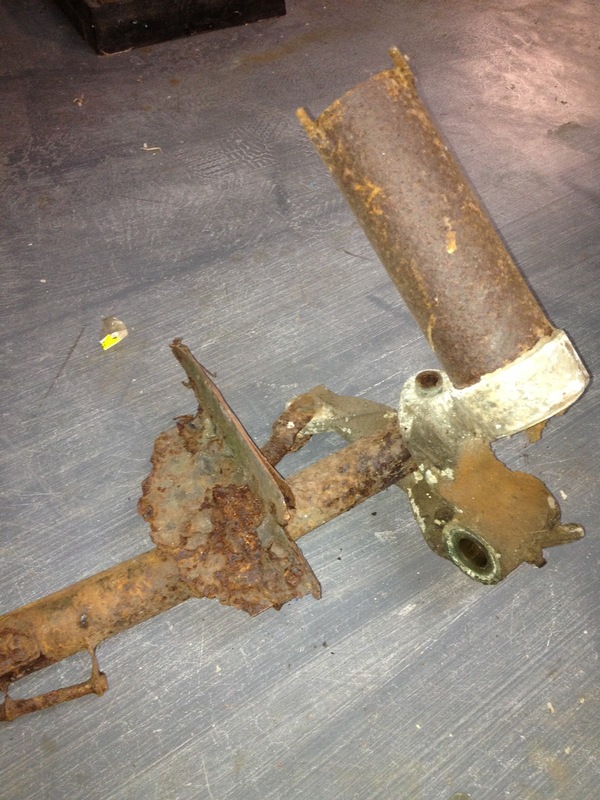 The axle was attached to the sub axle assembly with kingpins, which are grooved metal rods that keep everything together. Most of these cars will need new kingpins. If you’ve gotten this far it is false economy to not replace them. Here’s an easy way to tell if you need them: shake the wheel (preferably when it is on the car)- if you get ANY side to side movement you probably should replace the kingpins. What’s one more smelly, dirty, and ugly job? In theory kingpins are easy to replace. Remove the holding pin on the side of the main axle, remove the grease fitting at the bottom of the kingpin, screw in an extractor (you can make one out of a socket, long bolt, and a couple of nut and washers), and then slowly pull it out from the bottom. Reality is a bit different. 50 years of sitting had rusted mine up. I stripped two homemade extractors, and then went on to plan B. I used a lot of heat and penetrating oil to try to free the kingpin from the axle. Then I attempted to hammer it out from the top. Unfortunately, you can’t really get a good angle to hammer- the shock absorber gets in the way. I tried a number of times before I gave up and brought it to the machine shop. My guy got it out, and when I asked him how, he told me he used “a bigger hammer and a hotter torch”. That’s it for disassembly. Now you have a few weeks of renewal work ahead of you. If this work hasn’t fazed you, and you can do bodywork (or spend freely), you can restore a Heinkel car! Great post, thanks for all the pictures to go along with it! I would have had some trouble following along. Thank you all for great inspiration, I have just inherited a car from my father in law which he had stripped to bare bones I need help in starting to reassembly of this car and urgently need a workshop manual. can anyone help. I am in Äustralia.